Kin17_mid is the conserved central 169 residue region of a family of Kin17 proteins. Towards the N-terminal end there is a zinc-finger domain, and in human and mouse members there is a RecA-like domain further downstream. The Kin17 protein in humans forms intra-nuclear foci during cell proliferation and is re-distributed in the nucleoplasm during the cell cycle (PUBMED:10964102). This entry represents the conserved central 169 residue region of the Kin17 DNA/RNA-binding proteins. 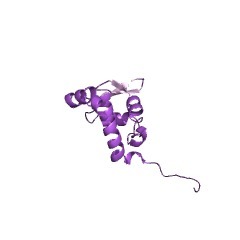 The N-terminal region of Kin17 contains a zinc-finger domain, while in the human and mouse proteins there is a RecA-like domain found in the C-terminal region. In humans, Kin17 protein forms intra-nuclear foci during cell proliferation and is re-distributed in the nucleoplasm during the cell cycle [(PUBMED:10964102)]. There are 1678 Kin17_mid domains in 1676 proteins in SMART's nrdb database. Taxonomic distribution of proteins containing Kin17_mid domain. This tree includes only several representative species. The complete taxonomic breakdown of all proteins with Kin17_mid domain is also avaliable. Click on the protein counts, or double click on taxonomic names to display all proteins containing Kin17_mid domain in the selected taxonomic class. Molecular cloning and characterization of the human KIN17 cDNA encoding acomponent of the UVC response that is conserved among metazoans. We describe the cloning and characterization of the human KIN17 cDNA encoding a45 kDa zinc finger nuclear protein. Previous reports indicated that mouse kin17protein may play a role in illegitimate recombination and in gene regulation.Furthermore, overproduction of mouse kin17 protein inhibits the growth ofmammalian cells, particularly the proliferation of human tumour-derived cells. Weshow here that the KIN17 gene is remarkably conserved during evolution. Indeed,the human and mouse kin17 proteins are 92.4% identical. Furthermore, DNAsequences from fruit fly and filaria code for proteins that are 60% identical to the mammalian kin17 proteins, indicating conservation of the KIN17 gene amongmetazoans. The human KIN17 gene, named (HSA)KIN17, is located on human chromosome10 at p15-p14. The (HSA)KIN17 RNA is ubiquitously expressed in all the tissuesand organs examined, although muscle, heart and testis display the highestlevels. UVC irradiation of quiescent human primary fibroblasts increases(HSA)KIN17 RNA with kinetics similar to those observed in mouse cells, suggestingthat up-regulation of the (HSA)KIN17 gene after UVC irradiation is a conservedresponse in mammalian cells. (HSA)kin17 protein is concentrated in intranuclearfocal structures in proliferating cells as judged by indirect immunofluorescence.UVC irradiation disassembles (HSA)kin17 foci in cycling cells, indicating a link between the intranuclear distribution of (HSA)kin17 protein and the DNA damageresponse.